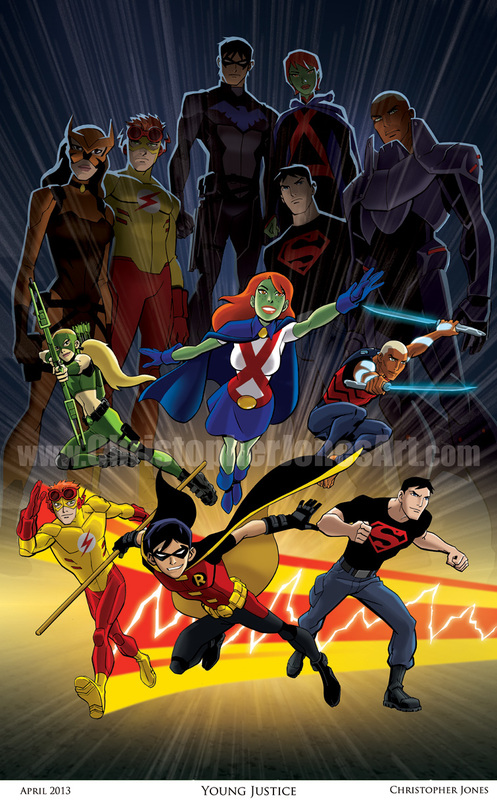 Christopher Jones Comic Art and Illustration Blog » New Young Justice print! I wanted to show you guys a preview of the new print I’ll have debuting at C2E2 in a couple of weeks! C2E2 (The Chicago Comic Book and Entertainment Expo) will be the first major convention I’ve attended since Young Justice came to an and, so of course I HAD to have a Young Justice pin-up in time for the show. I’ll be making the pin-up available as a print at C2E2, and after the convention it will be available in my Etsy Store. I’ll have more information about my schedule and other fun stuff I’ll be doing at C2E2 online soon! I’ll be at Table B7 in Artists Alley doing commission sketches and selling original comic book art at the show I hope to see many of you there!